With around 7,000 new rail vehicles on order to replace more than half of the passenger rolling stock fleet, Britain’s trains are about to change as never before. Scotland is no exception. In 2018, Hitachi’s Class 385 electric multiple units (EMUs) will replace the Class 170 diesel multiple units (DMUs) on the Edinburgh to Glasgow main line. Once further electrification is completed, more Class 385s will displace DMUs on services to Dunblane and through Shotts. This year will also see some of the iconic British Rail High Speed Trains (HSTs) get a new lease of life as specially refurbished four and five-car sets operating on Scottish Inter-City services. Passengers who sleep through the night between Scotland and London will also experience new trains being built by CAF in Spain for Caledonian Sleeper. These will be introduced later this year on services from Edinburgh and Glasgow to London and next year on sleeper trains to the far North of Scotland. From 2019, HSTs on the East Coast main line will be steadily replaced by new Azuma trains – Hitachi-built Class 800 bi-mode and Class 801 all-electric units. The Class 800 bi-mode units will operate services from London to Inverness and Aberdeen. Whilst introducing each one of these fleets is a complex task, there are also significant operational and maintenance interactions between these new train projects, including the transitional arrangements for their introduction. This is particularly true for the depots concerned, in which Hitachi has invested over £20 million for the Class 800 and Class 385 fleets. Currently, the Virgin East Coast depot at Craigentinny, just east of Edinburgh, maintains the East Coast HST fleet and services a wide variety of other stock (issue 139, May 2016). On the other side of Edinburgh, ScotRail’s Haymarket depot maintains and services DMUs including the Class 170 units that operate the main Edinburgh to Glasgow service. 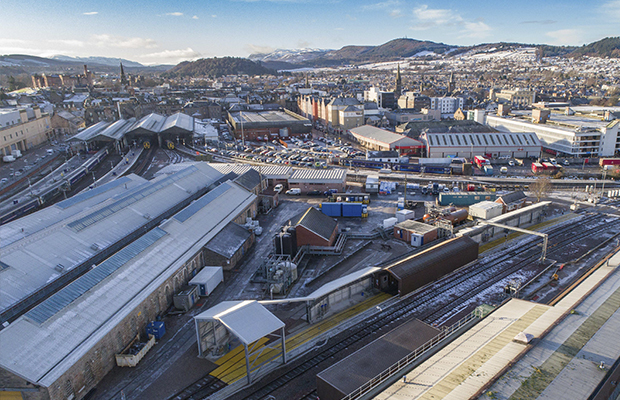 The depots at Inverness and Aberdeen service Caledonian sleeper trains, HSTs and ScotRail DMUs. The Edinburgh depots face significant changes of role and ownership. 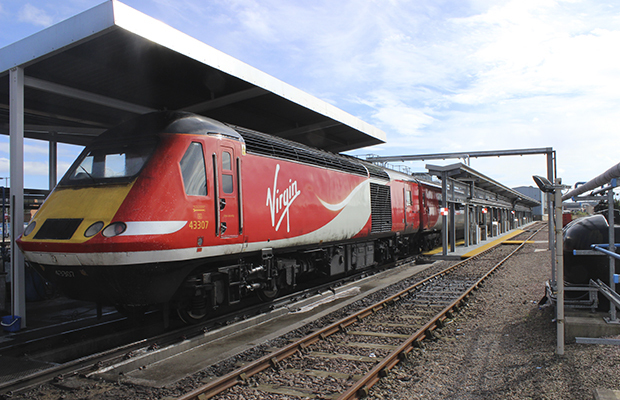 Later this year, Craigentinny’s lease transfers from Virgin East Coast to Hitachi, which will maintain both the Azuma fleet and ScotRail’s Class 385 units. As these are, respectively, the Hitachi AT300 and AT200 family of units, they have many similarities. These fleets will be subject to condition monitoring, both from sensors on the train and from condition monitoring stations such as the one at the new Millerhill servicing depot just south of Edinburgh. For Craigentinny, this is both a change in maintenance philosophy and the type of equipment maintained as, after the transition period, the depot will no longer maintain HST power cars as it has done for the past forty years. Ironically, Haymarket depot is to start maintaining HSTs for the first time as they start operating ScotRail’s inter-city services. This requires significant alterations to the depot to accommodate them. At the same time there will be a significant reduction in the number of DMUs maintained by the depot as Class 385 EMUs start running between Edinburgh and Glasgow. Over the following years, further electrification will see yet more DMUs replaced as Class 385 units start operation on Dunblane and Shotts services. Inverness and Aberdeen depots currently service Virgin East Coast HSTs, ScotRail DMUs and Mark 3 Caledonian Sleeper coaches. Soon they will handle East Coast Class 800 bi-mode units, ScotRail HSTs and the new Mark 5 Caledonian Sleeper coaches as well as some ScotRail DMUs. The coaches of the Class 800/801 units are 26 metres long, compared with 23 metres for an HST coach, and require depot alterations to accommodate them. Furthermore, the new Caledonian Sleepers and ScotRail’s refurbished HSTs have controlled-emission toilets (CET) that require discharge facilities. With the provision of on-board showers and other improved facilities, the capacity of the water tanks in the new sleeper coaches is three times that of the existing vehicles. These depots also require AdBlue® facilities so that new diesel engines on the Class 800 bi-mode trains can comply with Euro 6 emissions regulations by selective catalytic reduction. This is the injection into the exhaust gases of microscopic quantities of AdBlue, a non-toxic colourless urea and water solution. This combines with exhaust emissions to break down the harmful diesel exhaust mono-nitrogen oxides into nitrogen and oxygen. Ensuring that the existing depots can accommodate, service and maintain their new trains needs much planning, a high degree of co-operation between the train operators concerned and a lot of training. It also requires significant alterations to the depots concerned. Several companies are working to make this happen. One of these is Story Scotland, the Scottish division of Story Contracting, which has grown fivefold in recent years, allowing investment in future talent with apprenticeships and graduate schemes. The company has recently worked on various high-profile contracts including the slab track replacement in Queen Street tunnel (issue 142, August 2016), Stirling station canopy replacement (issue 141, July 2016) and St Ninians level crossing replacement (issue 158, December 2017). 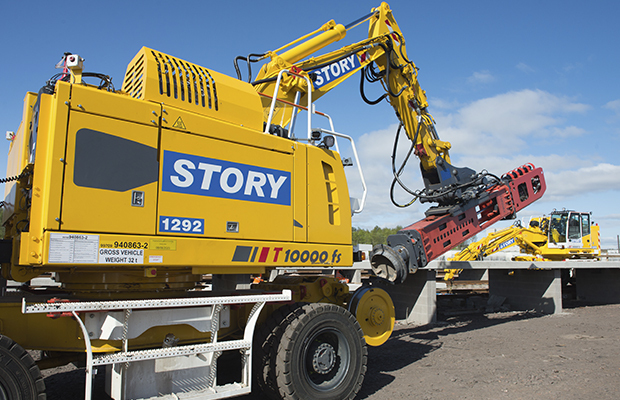 Story’s work at Aberdeen Clayhills depot, which was worth £1.8 million and took eight months, was completed in September 2017. This required the construction of a new 120-metre long servicing apron, a 60-metre trackpan for oily waste with associated drainage, four new refuelling points with modifications to the fuel distribution network, three new facilities and a plant room for CET as well as dispensers for AdBlue and water tanking. The positioning of these facilities and the length of the hoses were optimised to take account of the varying lengths of the different stock to be serviced. The work also involved alterations to associated M&E services, pipework, drainage and lighting, as well as new pedestrian walkways and access gantries. The work at Inverness depot was worth £2.2 million, took nine months and was completed last October. This required the construction of three new refuelling dispensers, an 85-metre trackpan for oily waste requiring the lift and replacement of 90 metres of track, four AdBlue facilities, three new CET facilities and a new canopy apron for which 33 micro piles were required. As at Aberdeen, this work also involved alterations to associated M&E services, pipework and drainage and had to take account of the varying train lengths. Due to the nature of depot operations, the work at Inverness required the construction of temporary fuelling facilities. A further complication is that the longer Class 800 units will block an existing level crossing in the depot during the fuelling operations. This required Story to provide a new alternative pedestrian crossing with a white light indication. There has been a depot at Inverness since 1855, since when many ‘nasty substances’ have dripped onto the ground. Hence, part of the design involved analysis of soil samples to determine the level of contamination. To avoid any future such pollutants, extra capacity was built into the new refuelling line’s drainage system to ensure satisfactory operation of the oil separators during extreme weather. Story’s project manager for both the Aberdeen and Inverness depot projects was Alan Rundell, who explained how the work was scheduled at Aberdeen. “Most of the Aberdeen servicing and refuelling takes place in the evening, with maintenance work done in the shed during the day. This means we had all day Monday to Friday to work except for the one sleeper train. We stood down for an hour to let it pass through the depot, to get it refuelled and then into the stabling area.” In contrast, around eight trains had to be refuelled during the day at Inverness, hence the need for the construction of a temporary fuelling point. 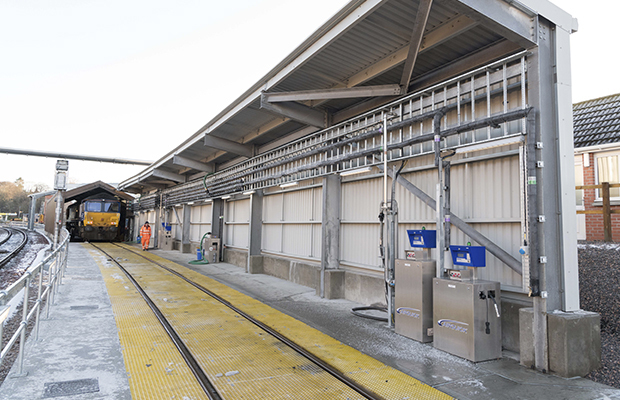 At both depots, everything had to work with the existing trains so, once all of the new add-ons were installed, everything was commissioned and transferred over to the new systems. Working within the confines of a depot environment requires flexibility to minimise the impact on depot operations. Story is not new to the complexities of depot work, as it is one of Network Rail’s collaborative delivery programme framework contractors for building work. One item of work, worth £336,000 and awarded under this contract, was the replacement of high-level sodium lighting with more efficient LED equivalents at Craigentinny depot. This required 359 lights to be replaced in four sheds. As the existing lighting controls, wire runs and power supplies were not replaced, this work was relatively straightforward. However, it required agreed channels of communication, which included weekly updates for the works, an access strategy that didn’t impact on the day-to-day running of the depot, and a detailed communication strategy. Last but, in this case, least of the work done by Story to support the introduction of Scotland’s new trains, was a £100,000 job, awarded under the framework contract, at Haymarket depot in November. This was the repair of the inspection pit on road number three, which had a defective rail joint for which concrete repairs were also required. This had to be done before work could start to modify the depot to accommodate the ‘new’ ScotRail HSTs. For this reason, all concerned were glad that Story was able to start work within three days once instructed to do so. 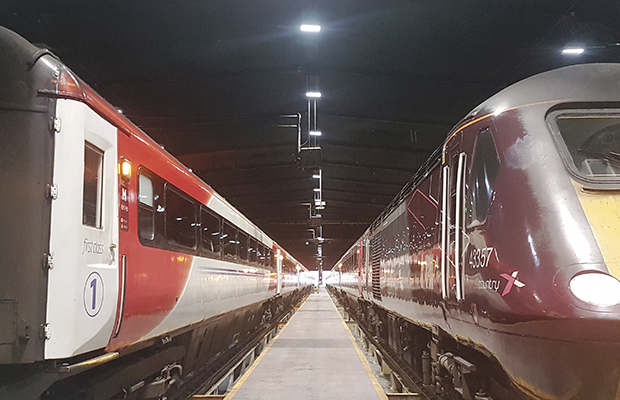 The longer Azuma trains will provide more seats on the East Coast route to Scotland whilst the introduction of ScotRail’s new trains will increase the number of rail passenger vehicles it operates from around 800 to 1000 over the next two years. Although the depot alterations for them are not obvious, Scotland’s rail passengers, who today often travel in overcrowded conditions, will have a good reason to thank companies like Story which have paved the way for these new trains.